Disclosure: Travel and accommodations were hosted by the Dreams Resort. 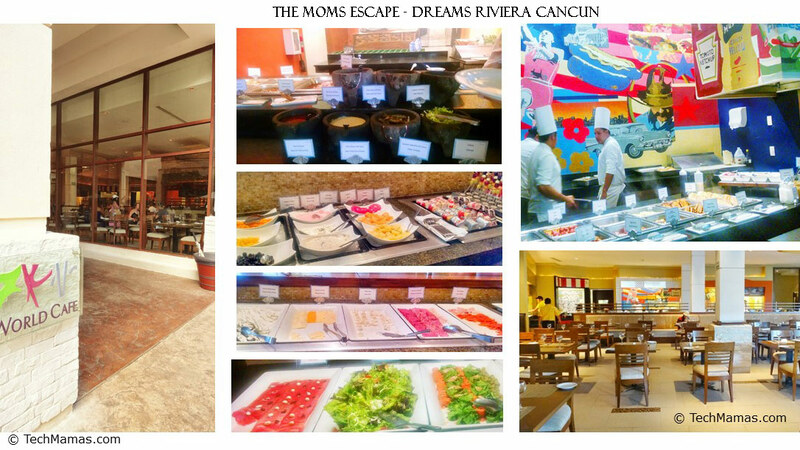 The Dreams Riviera Cancun Resort & Spa recently partnered with The Moms (Denise Albert and Melissa Gerstein) to invite a group of lifestyle bloggers to tour Dreams Riviera Cancun Resort & Spa in Mexico. 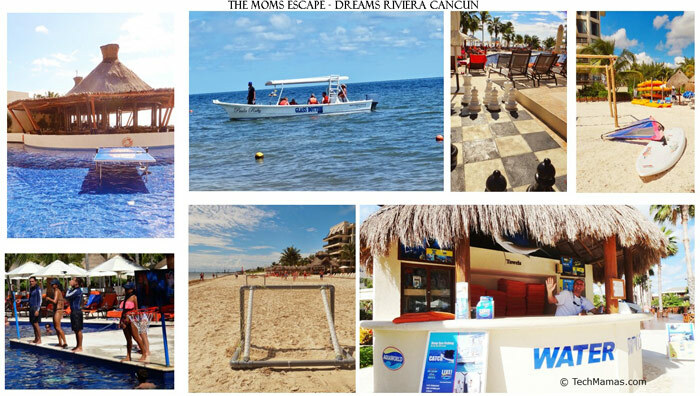 The trip, called “The Moms Escape,” was a wonderful escape to the beautiful Mexican Caribbean. While I had traveled to Cancun years ago, this is the first time I had toured an all-inclusive resort open to adults and kids. Although we spent time touring the resort, we also had time to unwind. It was during those quiet times wandering around the resort that I had to chance to take in the beautiful surroundings while enjoying quiet places to sit on the beach, bask in the sun and listen to the ocean. 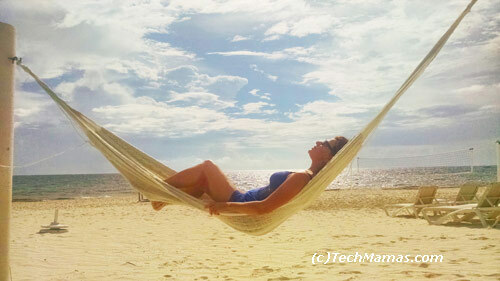 As a busy mom with three boys, just finding a quiet hammock by the beach put me in vacation mode. I sent a few friends pictures of the resort and said we should all come back for a gal’s weekend away! But I also enjoyed touring the resort so I set out to learn more. 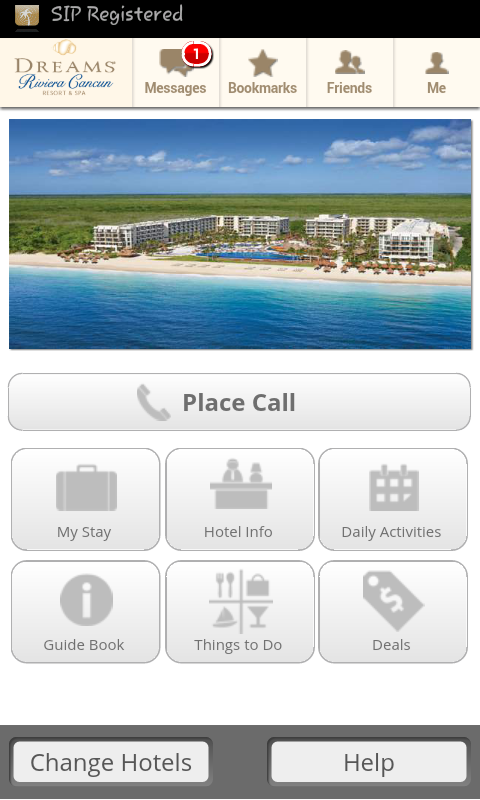 So… What is the Dreams Riviera Cancun Resort & Spa? From the website: “Dreams Riviera Cancun Resort & Spa is a luxurious getaway for couples, friends and families designed to reflect the charm of the Mexican Caribbean. Surrounded by glistening pools, lush tropical gardens and a palm-studded beach, this 486 all-suite resort defines Unlimited-Luxury with an array of amenities for every age and interest, from the Explorer’s Club, a supervised kids club, to a variety of daily activities, nightly entertainment and gourmet à la carte dining”. The resort is located between Cancun and Playa del Carmen on a stretch of beach which is in the Riviera Maya. Best yet, the world’s second largest barrier reef is a short boat ride from the resort beach. 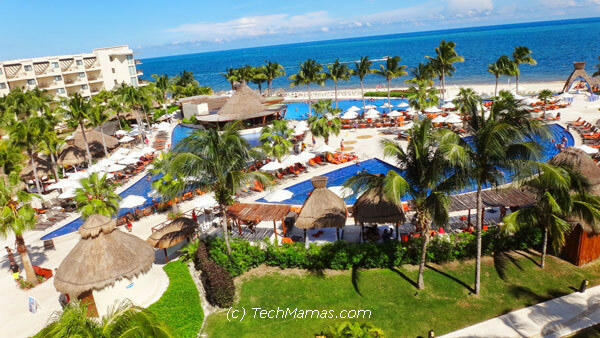 From a travel perspective, Dreams Riviera Cancun Resort & Spa is located a short 20 minute ride from Cancun Airport, which I found to be traveler (and family) friendly airport. 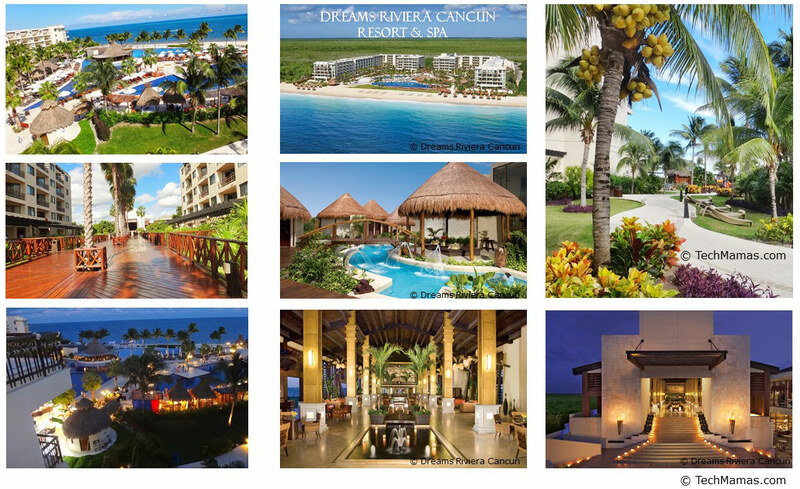 Dreams Riviera Cancun is an “all-inclusive” resort, offering a signature Unlimited-Luxury concept where everything, from gourmet a la carte dining to top-shelf premium spirits, is included with the stay. As a mom of three boys who eat “adult” portions, that means that I don’t need to worry a food bill because it is already factored into our stay. Family vacations can be stressful because going out to dinner with voracious boys can break the bank. I want to relax on vacation, not worry about day to day expenses, so inclusive offerings is great for our family. Dreams Riviera Cancun’s Unlimited-Luxury offering includes “Full breakfast, lunch, dinner and snacks each day, Theme parties, oceanfront bars and entertainment venues, unlimited natural fruit juices and soft drinks (for kids) and unlimited international and domestic top-shelf spirits, Mini-bar refreshed daily with soft drinks, bottled water, and beer, 24-hour room service, pool and beach wait service , Explorer’s Club for kids with supervised activities, Indoor theater, Complimentary greens fees at nearby Grand Coral Riviera Maya golf club and All taxes and gratuities”. The restaurants included in Dreams Riviera Cancun’s Unlimited-Luxury are six à la carte gourmet restaurants, a buffet venue, a grill and a café as well as 24-hour room service: World Café ( International cuisine buffet-style), El Patio (Mexican cuisine), Himitsu ( fusion of Pan-Asian delicacies), Portofino (Italian cuisine), Oceana (Seafood), Seaside Grill, Bordeaux (French cuisine –Adults Only), Coco Café (Coffees, teas and pastries served daily), Barefoot Grill (Made-to-order snacks). One of the night activities during our stay was a poolside themed party that included tables with linens and beautiful stations along the edge with all types of food to enjoy (also included as part of Unlimited-Luxury). There is also a great selection of bars for adults: Rendezvous (Lobby Bar), Barracuda (Beach Bar), Sugar Reef (Pool Side Bar), Manatees (Swim-up Bar), Desires (Music Lounge) and Revive (Spa Bar). There is live, nightly family-friendly entertainment, including music at the Lobby Bar on select nights if you want to dance with your family after dinner. For adults who want to dance the night way, Desires is a good fit. For couples that want some extra romance, they can reserve in advance a private candlelit, seaside dinner for two (additional cost). My favorite restaurants (although we did not have time to try all) were the Bordeaux and the World Café. The Salmon dinner we had at the Bordeaux cafe was the perfect mix of fresh food, great tasting flavors and an artful presentation. If we had more time I would have also enjoyed trying the Seaside Grill on the pool front just for that great view! I found that the restaurants offered a great variety of food, including salads, fruit and vegetarian offerings, my personal preference. Room service is also included and I enjoyed a great salad delivered to my room. The resort has filtered water and I had no problem with drinking the water, ice or eating the salads. The only water that is not filtered is the sink water in the rooms, so I used the ample bottled water in the room to brush my teeth and drink at night. Note: Although taxes and gratuities are included, I did choose to tip when I felt I received extra or unique service. I traveled for business around the world before I got married and experienced a wide range of hotel accommodations. 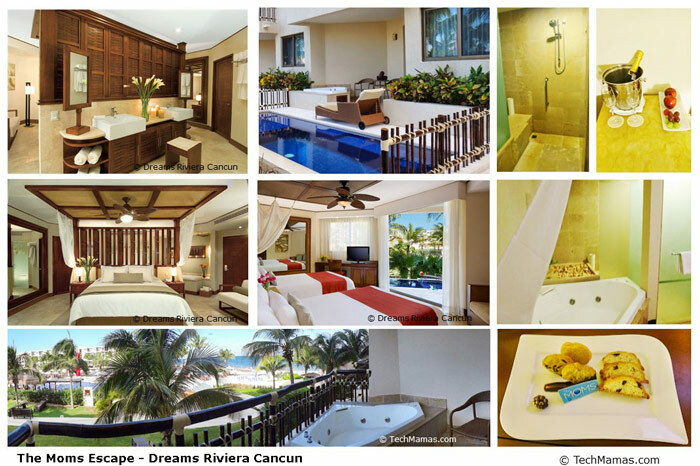 I found the quality of the rooms at the Dreams Riviera Cancun luxurious. We stayed on the preferred floor and also had a chance to tour a range of other rooms. All rooms were clean and well-appointed, with details including a stone-tiled bathroom, comfortable beds, and fresh linens. I also appreciated the separate bath and shower, with an easy to use shower handle located near the front of the shower where you step in. So many hotels have the shower handle directly underneath the shower head, and I get sprayed with cold water when starting the shower. I had purchased an international cell phone plan but had trouble connecting in Cancun. So I was thrilled to use the resort app for WiFi not only in the room but across the resort to stay online and make the calls home during the trip. Having regular access to WiFi allowed me to efficiently get online when I needed to and “unplug” when I needed a break. I did find that at times I needed to re-log into the WiFi when I changed locations in the resort. But the connection always worked. Note: I did find my mobile phone’s international plan helpful at the Cancun Airport when my flight was delayed. I was able to make the calls I needed to rearrange plans after I found out I needed to stay the night in Phoenix! The options for spa adventures were dreamy! The resort offers a variety of classes at the beautiful fitness area as well as poolside. As I was taking pictures around the resort I found a morning yoga class near the beach that looked very scenic and centering. The next morning I was lucky to do yoga with the other women in our group by the pool, lead by Melissa. At first I was not excited to wake up at dawn for a yoga class down by the Dreams Riviera pool, but as the sun rose I quickly concluded it was a great way to start the day. Melissa shared some of her favorite yoga techniques, one of them called Vinyasa and I was so inspired I started taking Vinyasa when I got home! The Dreams Spa by Pevonia with options including full spa menu of body treatments and rejuvenating therapies, Hydrotherapy whirlpool baths, Steam rooms and cold plunge baths, Swedish saunas, Swiss showers, Warm cascading outdoor Jacuzzi, Ocean front massage cabins, Garden palapas, Facials and Beauty salon. Spa services are at an additional cost, but access to hydrotherapy treatment is included with Preferred Club stay. One of the most important things after food for families on vacation is activities. Dreams Riviera Cancun has a range of different activities including pool, beach, ocean and plenty of areas for relaxation. And seriously, one of the most important things I look for in family vacation resorts is the ability for us all to relax to take a break from our busy lives! Along with the spa, there are many other ways to relax. For one, there are shaded huts along the pool area, and well-cushioned beach chairs in the pool and beach area. One of my favorite areas to chill was a hut bar with swings located down on the beach. Whether it be a bottle of water or Sangria, sitting on a swing sipping a drink near the beach is a great way to unwind and take in the sea air. Along with the quiet spaces, the pool area also has many activities throughout the day and night. There is a shallow kid’s pool area and across a footbridge is an ankle level pool with ping pong tables that really looked like fun. On the other side is a pool with basketball hoops and regularly scheduled activities (including water exercises and even dance lessons!). The pool area also has a big chess set that my twins would of loved to compete against each other for some downtime fun. Closer to the beach was my favorite pool that included a pool bar and a very well designed “infinity” style that looked as if it were linked with the ocean. This was an adult area that generated a fantasy vision of time spent just lying on a raft, getting up only for visits to the pool bar. I also just enjoyed sitting on my balcony looking at the beauty of the pool and beach areas! The beach area had nets set up for volleyball and soccer games. For those who wanted to take advantage of the ocean more there was a water activities desk where you can reserve (at an additional cost) snorkeling equipment, a sailboat or even a trip in a glass bottom boat. One more exciting aspect of the Dreams Riviera Cancun is that it is located a short boat ride out from the world’s second largest barrier reef. Resorts that are close to reefs can have more seaweed in the oceanfront like I found at Dreams Riviera Cancun. When it comes to ocean activities with three boys, I prefer they swim in pools so I can watch them. However, if we go into the ocean, activities like snorkeling are great for our family to do together. My kids love looking at fish and the reef would certainly be a draw. For even more adventure, there are tours and excursions available. The Amstar website has the pricing and a listing of tours for each location (i.e. Cancun), resort (i.e. 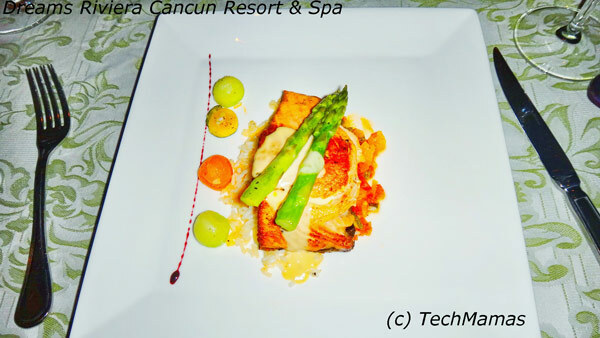 Dreams Riviera Cancun) and by type of activity. For example, for my history buff son would want to visit the Tulu private tour. As part of the Mexican Caribbean, Cancun is known for it’s warm sunny climate. But with any tropical climate there is changing weather such as rain during the year. When I checked the weather websites before the trip mid October, it showed 4 days of rain during the tail end of our trip. But then I read that weather estimates in Cancun can be off because the weather moves quickly from one area to another. I found that to be true during the trip. While it did rain, it mostly rained at night and early morning. When it did rain during the day it was the tropical type of rain that passed quickly. That left us with days of beautiful sun to enjoy during our stay. Kids ages 3 to 12 can go to the Dreams Riviera Cancun Explorer’s Club which can give their parents some time to themselves while their kids have fun! The program is a fully supervised and includes activates such as sandcastle competitions, arts and crafts and creative play, with a large playground and game room plus weekly adventures. You can also reserve a sitter through the resort (additional cost). During our trip I saw kids with a sitter playing soccer on the beach and another group having dinner while their parents enjoyed a romantic night out. 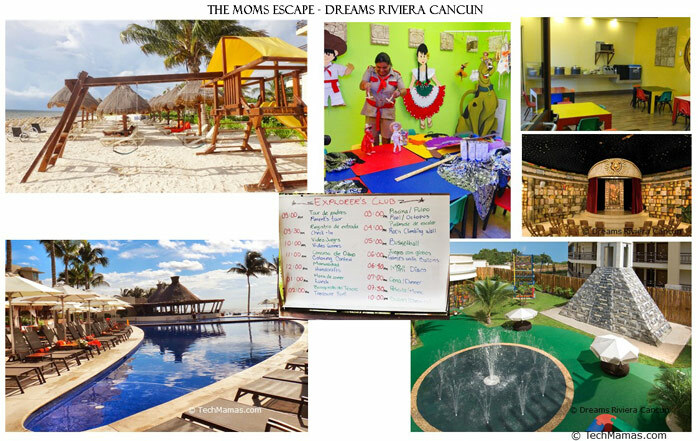 The Dreams Riviera Cancun is not only a beautiful resort in the exotic Mexican Caribbean, but it has activities that families, couples or groups of friends can enjoy together. The customer service was top rate, everyone had a smile on their face that helped set the tone for a fun vacation. There are lots of types of vacations, but when you are looking for a luxurious resort that is able to offer everything from quiet spaces to relax, dancing at night to adventures at the pool or beach and access to the world’s second largest barrier reef offshore – the Dreams Riviera Cancun Resort & Spa is a great option. Diane Mizoto from The Spiritual Playground brought her camera and captured the essence of how we all felt spending time connecting, adventuring and relaxing as the perfect break from the daily grind we have back home. Disclosure: Travel and accommodations were hosted by the Dreams Resort. All opinions are my own. 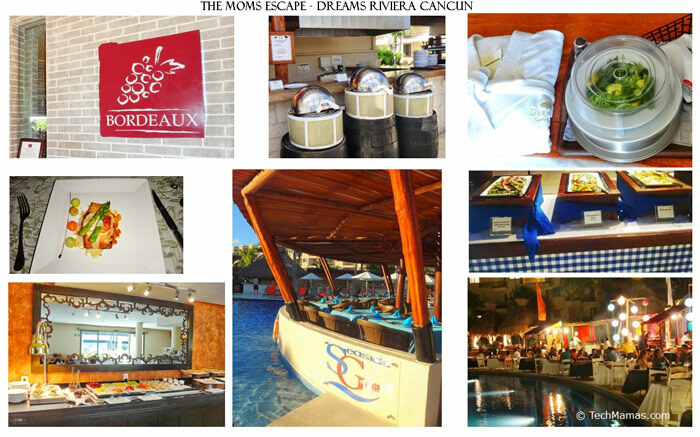 Thanks to Dreams Resort and The Moms for hosting such a fabulous #TheMomsEscape. Shout out to Miracle Suit who supplied us with fun swimsuits (shown on my hammock picture) that made this mama feel like a Stud Muffin for weekend.